Download "1.1 Electronic Computers Then and Now"
1 1.1 Electronic Computers Then and Now The first electronic computer was built in the late 1930s by Dr.John Atanasoff and Clifford Berry at Iowa State University in USA. They designed their computer to assist graduate students in nuclear physics with their mathematical calculations. The first large-scale, general purpose electronic digital computer, called the ENIAC, was completed in 1946 at the University of Pennsylvania with funding from the US army. These early computers used vacuum tubes as their basic electronic component. Today new generations of computers were considerably smaller, faster, and less expensive than previous ones. Using today s technology, the entire circuitry of a computer processor can be packaged in a single electronic component called a computer or microprocessor chip. These chips are installed in watches, PDS s (Personal Digital Assistance), GPS systems, cameras, home appliances, automobiles, and of course computers. Modern computers are categorized according to their size and performance. Personal computers : Used by a single person Mainframes: Large, very powerful, real-time transaction processing systems, banking networks, ATMs reservations systems for airline, motels, etc.. Supercomputers: Largest capacity and fastest computers, used by research laboratories and computationally number crunching application such as weather forecasting. 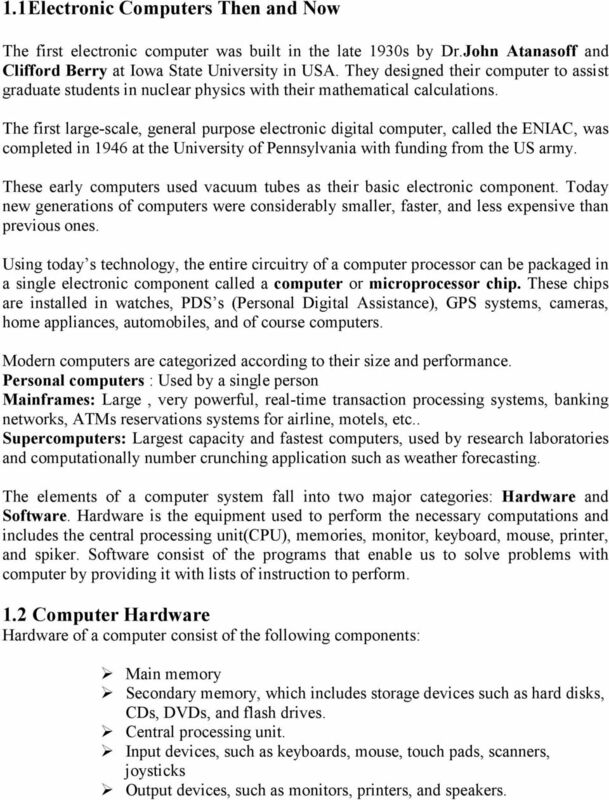 The elements of a computer system fall into two major categories: Hardware and Software. Hardware is the equipment used to perform the necessary computations and includes the central processing unit(cpu), memories, monitor, keyboard, mouse, printer, and spiker. 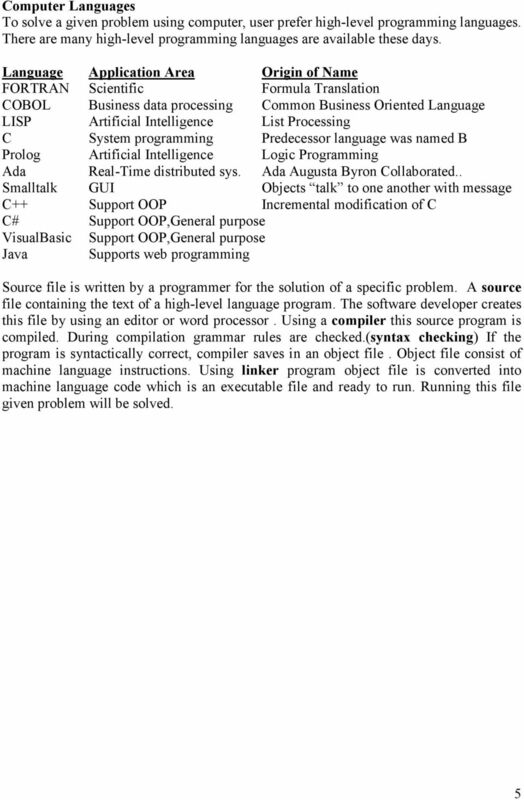 Software consist of the programs that enable us to solve problems with computer by providing it with lists of instruction to perform. 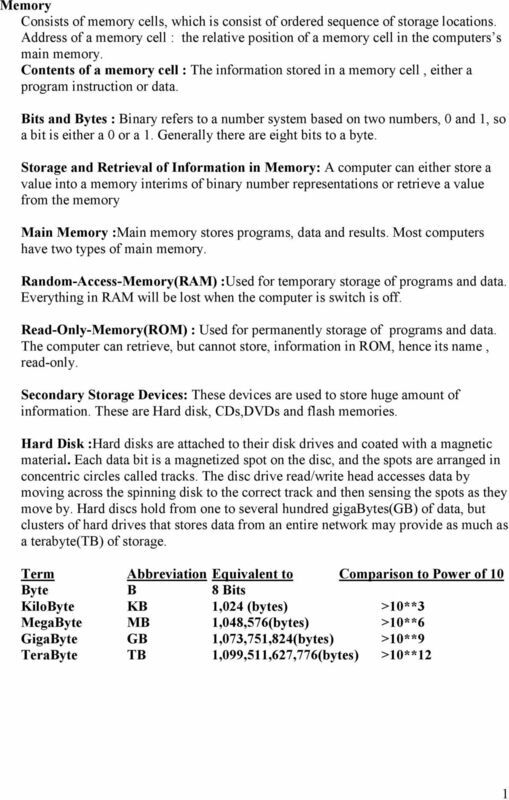 1.2 Computer Hardware Hardware of a computer consist of the following components: Main memory Secondary memory, which includes storage devices such as hard disks, CDs, DVDs, and flash drives. Central processing unit. Input devices, such as keyboards, mouse, touch pads, scanners, joysticks Output devices, such as monitors, printers, and speakers. 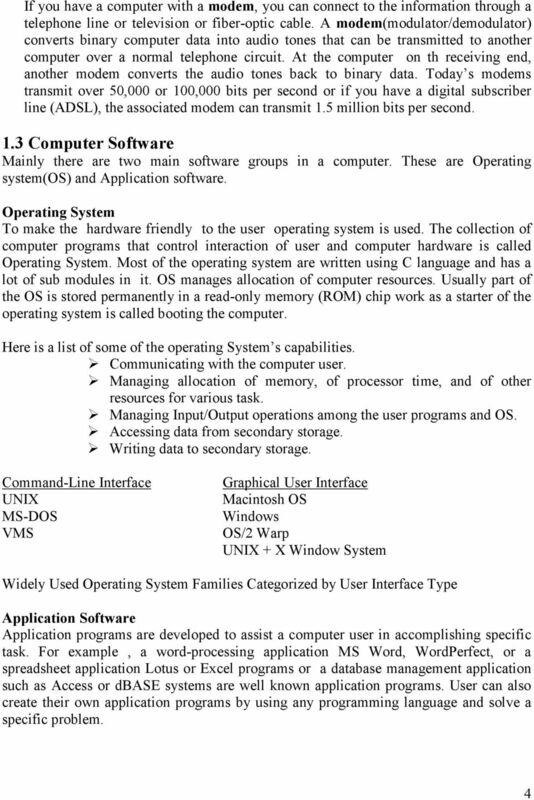 OVERVIEW OF COMPUTER SYSTEMS. A.1 Introduction. A.2 What is a Computer? Computer Basics Worksheet Name: Directions: Complete this worksheet by filling in the blanks or as directed by your instructor. To learn about each section click and visit the Unit 1 page under Resources. Any digital computer carries out five functions in gross terms: Stores the data/instructions in its memory and use them when required. Chapter 4 The Components of the System Unit The System Unit Box-like case that contains computer s electronic components Sometimes called the chassis What are common components inside the system unit? In some cases the PC may have no case at all. In this instance the components may be held inside the monitor. Question 2. Question 3. 0 out of 1 points. The basic commands that a computer performs are, and performance of arithmetic and logical operations. 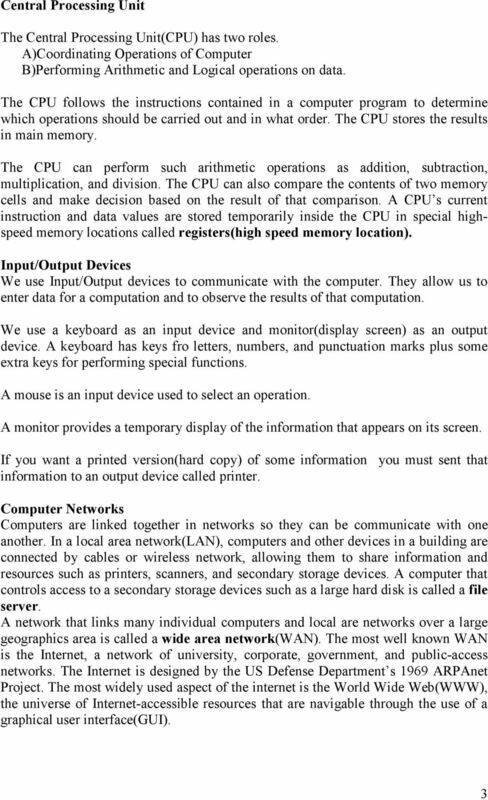 The basic commands that a computer performs are, and performance of arithmetic and logical operations. 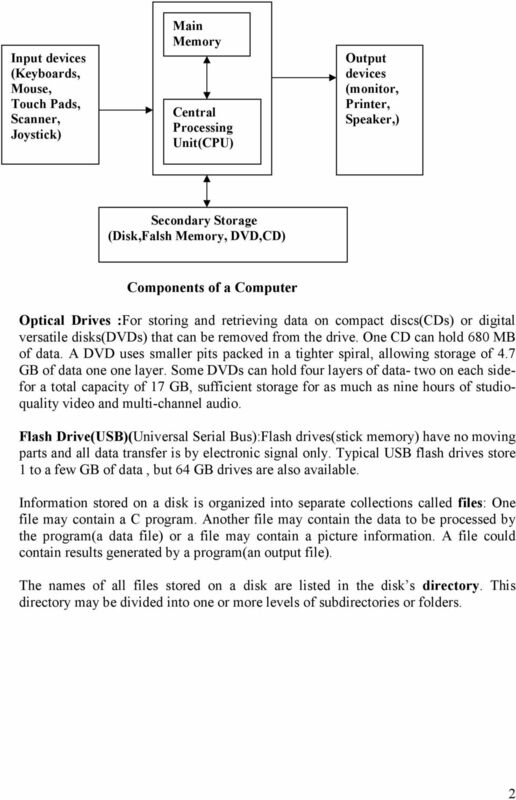 input, file Question 2 input, output, storage output, folder storage, directory Main memory is called. part 1 Computing Fundamentals 1 Unit 1 n Exploring Computers Chapter 1 Lesson 1 1 Lesson 1 2 Lesson 1 3 Chapter 2 Lesson 2 1 Lesson 2 2 Lesson 2 3 Computer Basics What Is a Computer? What Is Computer Hardware?